Now I've been to my fair share of festivals in the past, so I think I've learned a thing or two about what not to wear along the way. As boring as it might sound, practicality is the key to festival-wear. If you want to have fun, it's a bit difficult if you're wearing clothes that just aren't suited to what's going on around you, and if you're going to one in Britain, the weather is predictably unpredictable, so playing it safe is your best bet. 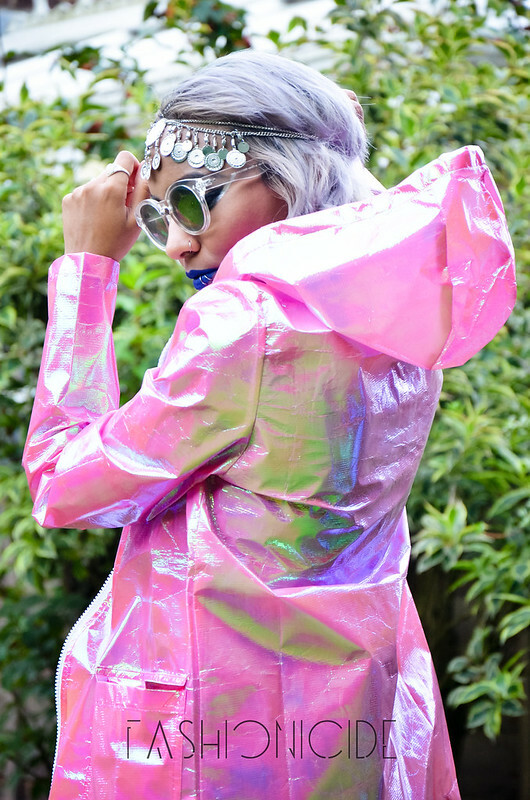 That's why my number one festival essential has to be the humble Parka. 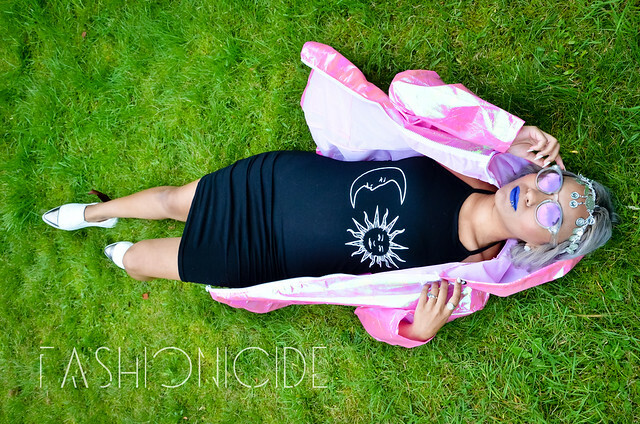 Sling that over the top of an easy dress or bodycon with a light shirt and you've got all bases covered: if the sun comes out to play you won't get too hot, but if it gets sodding wet you won't get too cold either. 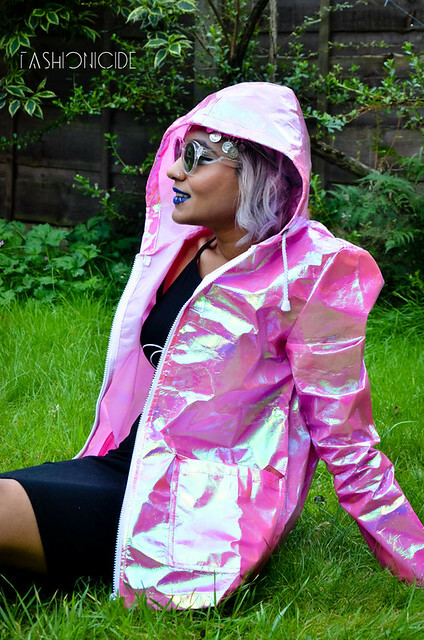 Plus, your trusty Parka will keep you fairly dry - so it's no wonder I was excited to receive this stunning iridescent Parka. It's like it was made for me! I also picked out a black halterneck dress with moon and sun print, as it had that kooky festival air to it, whilst also looking pretty easy to wear. The last item I chose probably looks a little less practical, but I've been trying to grow out my fringe of late and have been wearing headbands quite a bit, so this coin medallion headpiece was perfect - it looks great and will keep my hair in order when I'm bouncing around to the beat in a field! I have to say I've probably cheated a little bit, as I didn't buy the footwear or the shades, but to be honest why waste a new pair of shoes on a dirty, sweaty, muddy field? My philosophy is to wear an old pair you'd be happy to dispose of afterwards. And no, I'm not wearing wellies. I genuinely cannot stand them, no amount of rain forecast could make me resort to such a crime against fashion and general sensibility. UGH. As for the shades and all of the other accessories for a festival, why wear anything that you actually enjoy wearing day to day? The chances are, you're probably going to lose it, break it or get it irreperably dirty. Don't put your nice things through the pain of a festival, just throw on some old stuff you aren't too bothered about and lose yourself over the weekend. Trust me, you don't want to be worrying about your expensive or treasured clothes, shoes or accessories - you want to be having fun! It's been a little while since I was last at festival, but I have to say that Parklife and Creamfields are amongst my favourites. Creamfields satiates my taste for electronic and dance music whilst Parklife is practically on my doorstep, plus they usually have a decent line up. Any festival I do go to though has an awful lot to live up to, the best gig I've ever been to was Groove Armada at the Manchester Academy on their final live tour - it was sensational from start to finish - I genuinely don't think anything could match that! 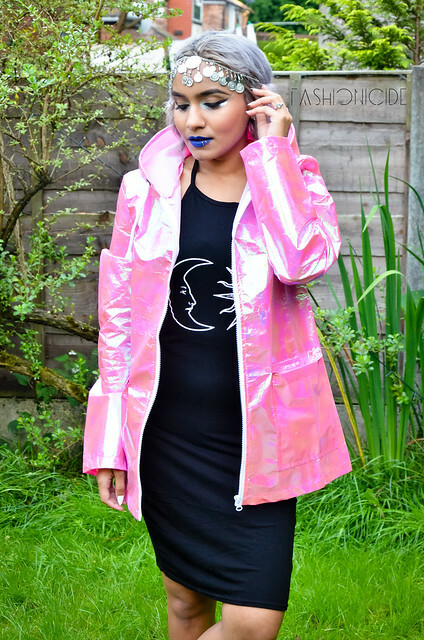 The outfit I picked out was inspired by my love for spine-tingling, epic electronic soundscapes, I'm thinking RÜFÜS, Groove Armada, Anoraak. The outfit and the music I tend to listen to gives me this indescribaby strange nostalgia for the future. What was the best festival you've ever been to? 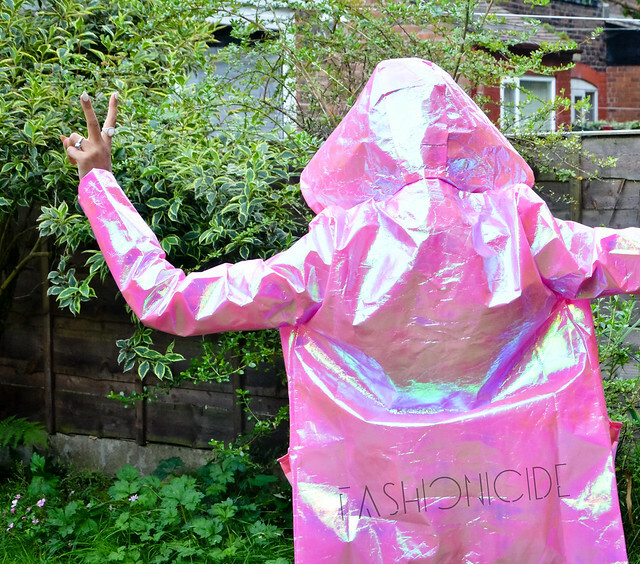 What festival fashion tips do you have? And what kind of music gets you moving? I love Boohoo and your outfit is amazing. I've never been Park life or Creamfields but I've always wanted to go to both. I love the outfit! It's real cute. Yeah, I agree.. Never wear anything new or something you really LOVE to a festival. 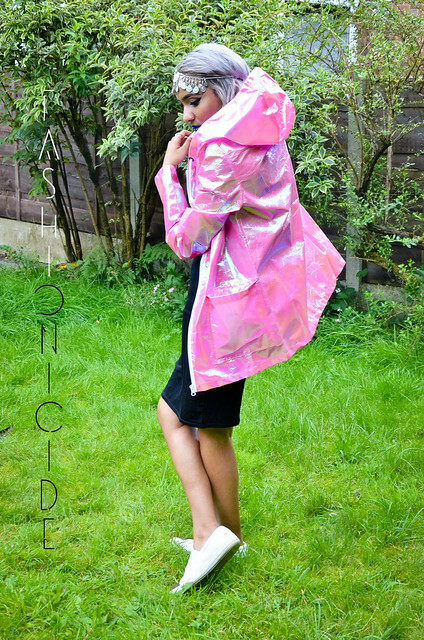 I really want a holographic rain coat like that to take to Bestival with me, they look amazing! I love your dress as well!